Ten years ago few people made this, but nowadays it is all the rage (resulting in my local chemist running out of citric acid this year). Here’s how. Get a carrier bag (or a roomy basket, if you want the full bucolic experience) and a pair of scissors. Phone a friend/Google/stick your head out the front door and work out where your nearest stash of elderflowers are. You will be surprised how many there are and – very likely – how close to your home. You may have passed them without noticing many times. I have lived in London for 25 years and in all my homes in the city I have been within a walk or a short Tube ride from a good source of elderflowers. The first time I went to collect them I actually took a picture with me printed from the internet. The scent is a dead giveaway (elderflowers smell of muscat), but I was still nervous and wanted to be sure I was picking the right thing (quite a lot of other plants look like elderflowers, but if you have a picture, you will be sure to get it right). Go with a mate and you will spend a thoroughly enjoyable couple of hours pulling on branches, snipping off the boughs with the freshest looking blooms and getting grass stains on your clothes. Be sure to choose bushes that are away from busy roads, and pick only those blooms that are newly opened and are a pure creamy white colour (brown blossoms are past their best). When you sniff them, they should have a gentle fragrance. Once home, cook them the same day if possible. After 24 hours they will start to smell of cat’s pee (not good) and even after a night sitting in the kitchen they will be giving off a slightly sickly smell, so use them when they are at their freshest. Gently shake the elderflower heads to dislodge any bugs. Put the sugar and 1.5 litres (2 ½ pints) of water into a saucepan and bring to a boil, stirring from time to time to help the sugar dissolve. 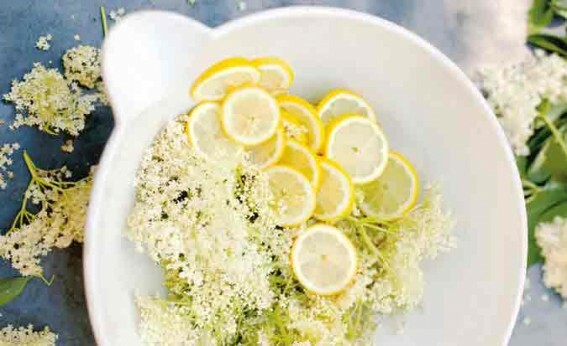 Remove the zest from the lemons in broad strips with a sharp knife and put in a bowl with the elderflowers. Slice the lemon flesh thinly and add this to the bowl. When the sugar syrup has come to a boil, pour it over the flowers and lemons. Stir in the citric acid. Cover with a clean dry cloth and leave in a cool, dark place for 24 hours. Taste the resulting liquid and judge whether you want it to be any tarter (I sometimes add the juice of one more lemon, it depends on how tart you want the cordial to be). Strain the cordial through a muslin-lined nylon sieve into a large jug. Pour this into warm, sterilized bottles and seal. Leave to cool and keep in the refrigerator. It will be okay for about five weeks. Keeping it for longer involves heating the bottles of cordial in a water bath. I can never be bothered to do this, but you can freeze it, or just drink it when it’s fresh.